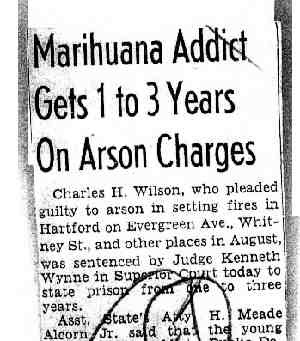 “Charles H. Wilson, who pleaded guilty to arson in setting fires in Hartford on Evergrean Ave., Whitney St., and other places in August, was sentenced by Judge Kenneth Wynne in Superior Court today to state prison from one to three years. Please submit a report to this office on the above matter. 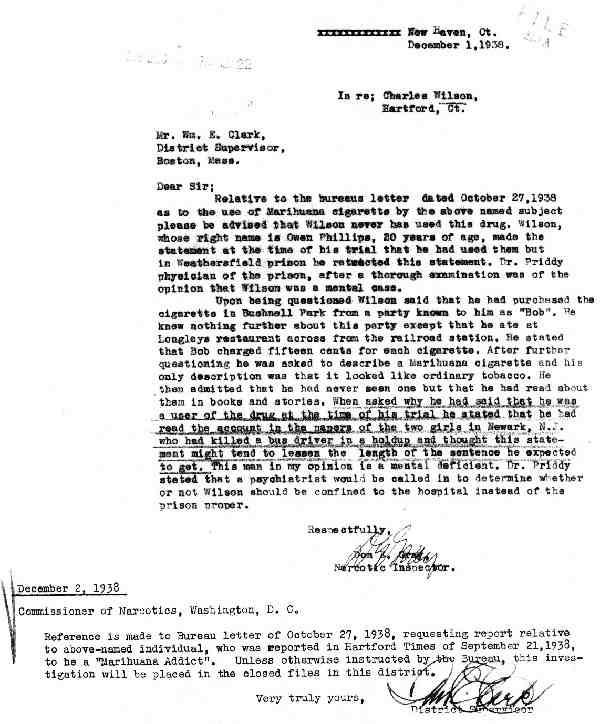 Relative to the bureaus letter dated October 27,1938 as to the use of Marihuana cigaretts by the above named subject please be advised that Wilson never has used this drug. 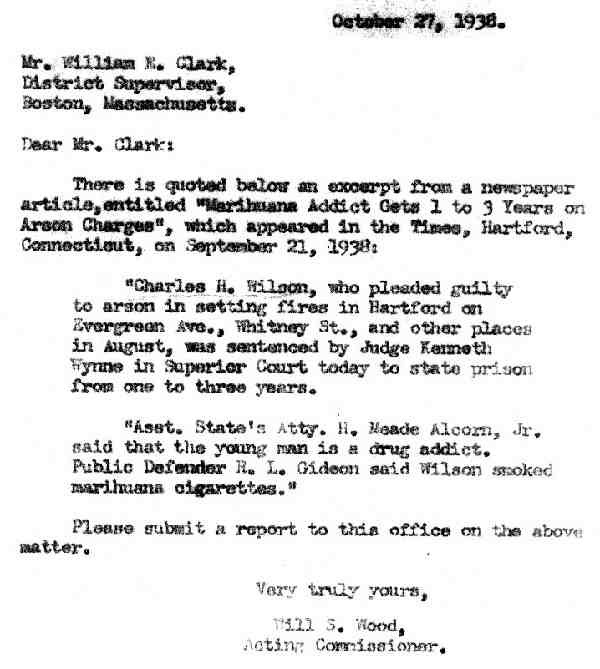 Wilson, whose right name is Owen Phillips, 20 years of age, made the statement at the time of his trial that he had used them but in Weathersfield prison he retracted this statement. Dr. Priddy physician of the prison, after a thorough examination was of the opinion that Wilson was a mental case. Upon being questioned Wilson said that he had purchased the cigarette in Bushnell Park from a party known to him us “Bob”. He know nothing further about this party except that he ate at Longleys restaurant across from the railroad station. He stated that Bob charged fifteen cents for each cigarette. After further questioning he was asked to describe a Marihuana cigarette and his only description was that it looked like ordinary tobacco. He then admitted that he had never seen one but that he had read about them in books and stories. When asked why he had said that he was a user of the drug at the time of his trial he stated that he ad read the account in the papers of the two girls in Newark, N.J. who had killed a bus driver in a holdup and though this statement might tend to lessen the length of the sentence he expected to get. This man is my opinion is a mental deficient. Dr. Priddy stated that a psychiatrist would be called into determine whether or not Wilson should be confined to the hospital instead of the prison proper. 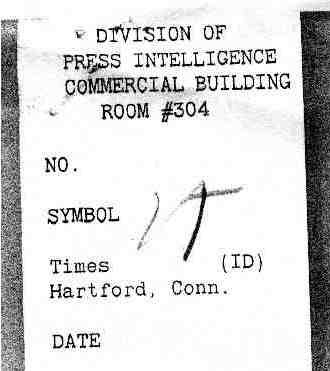 Commissioner of narcotics, Washington, D.C.
Reference is made to Bureau letter of October 27, 1938, requesting report relative to above-named individual, who was reported in Hartford Times of September 21, 1938, to be a “Marihuana Addict”. Unless otherwise instructed by the bureau, this investigation will be placed in the closed files in this district.